“Our country is now all, except in designation, a dictatorship and if it is not yet, then we are not far from it. Zambia, according to its 1996 constitution, is officially Christian. Just over three-quarters of the population profess allegiance to various Protestant denominations; while just over one-fifth is Roman Catholic. The rest of Zambia’s 16 million population are a combination of Animist (2.5%), Atheist (1.8%) and Muslim (0.5%). Since its political independence in 1964, Zambia has enjoyed relative stability, despite its many challenges related to its landlocked location in Southern Africa. The past decade has seen Zambia’s economy struggle with low commodity prices, mine closures, rising unemployment, power shortages, a widening budget deficit and diminishing foreign-currency reserves. Since the start of the decade political tensions have deeply divided the country. 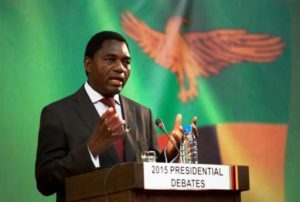 Two recently disputed Presidential elections, in 2015 and 2016, narrowly won by President Edgar Lungu of the Patriotic Front (PF), have been bitterly disputed by the President of the opposition United Party for National Development (UPND), Hakainde Hichilema. 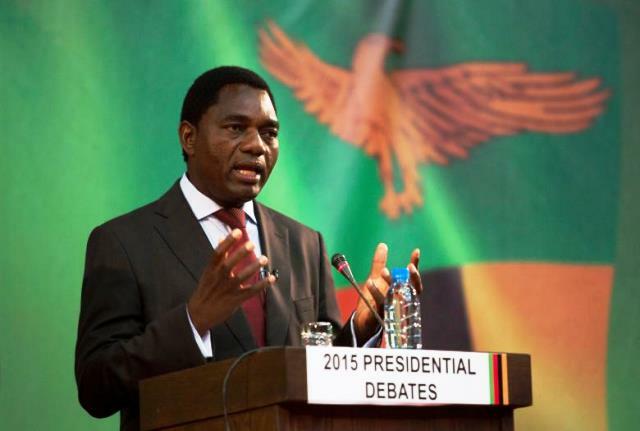 Hichilema (54) is a millionaire and the second-largest rancher in Zambia. Lungu (60) is a lawyer by profession who, in 2010, had his law practicing license suspended by the Law Association of Zambia (LAZ), having been found guilty of professional misconduct. On 9 April 2017 an incident in Mongu, in the Western Province, involving rival cavalcades of both President Lungu and Mr Hichilema has resulted in the arrest and imprisonment of Hichilema, accused of treason. “For genuine dialogue to take off, both parties must take some responsibility and acknowledge their part in the current unfolding scenario. Otherwise, two quarrelsome adults cannot drag the entire country into their egoistic shenanigans. 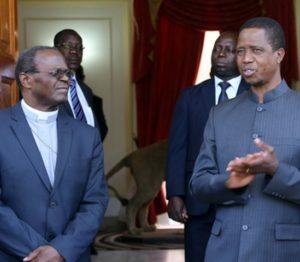 President Edgar Lungu and Hakainde Hichilema are behaving like two high school students fighting for the attention of the hottest cheek in school. That stunt in Mongu should never have happened but equally the amount of force unleashed in response has been as reckless. Adamu’s reference to ‘the church has spoken’, followed a statement issued the previous day by the Archbishop of Lusaka, Telesphore Mpundu, President of the Zambia Conference of Catholic Bishops (ZCCB). The Zambia Conference of Catholic Bishops (ZCCB) said this must be stopped and reversed henceforth. “Let the politicians of both parties take it from us since we always have our ears close to the ground that our country now stands on the edge. It is no use playing an ostrich game by burying our heads in the sand thinking that the storm will pass away. It will not, at least not before it has done great harm to this nation. The Society first established a presence in Zambia in 1973 when Fr Michael Igoe (Co Westmeath) and Sexton Doran (Co Down) arrived to minister in Ndola diocese at the invitation of the then Bishop Agnozzi OFM Conv. Both had been missionaries in Nigeria for many years. Fr Doran had also served as Vocations Director and Local Superior in Dromantine. They were involved in pastoral work in Francisdale Mission, on the outskirts of Ndola, the second-largest city in Zambia. Today, our SMA missionaries minister in the Archdiocese of Lusaka and the dioceses of Kabwe and Ndola. Several Zambian SMA priests are on mission in other parts of Africa. The Society has a Formation House for training Zambian seminarians in Kabwe, Zambia. The Regional Superior for Zambia is Fr Gustave Mukosha who resides in the SMA Regional House in Ndola. He is assisted by Fr Martin O’Farrell SMA, from Cork City, Ireland.